Tantrix has been around since 1988 and was invented by Mike McManaway from New Zealand, although the origins of the puzzle are even older and with some differences. 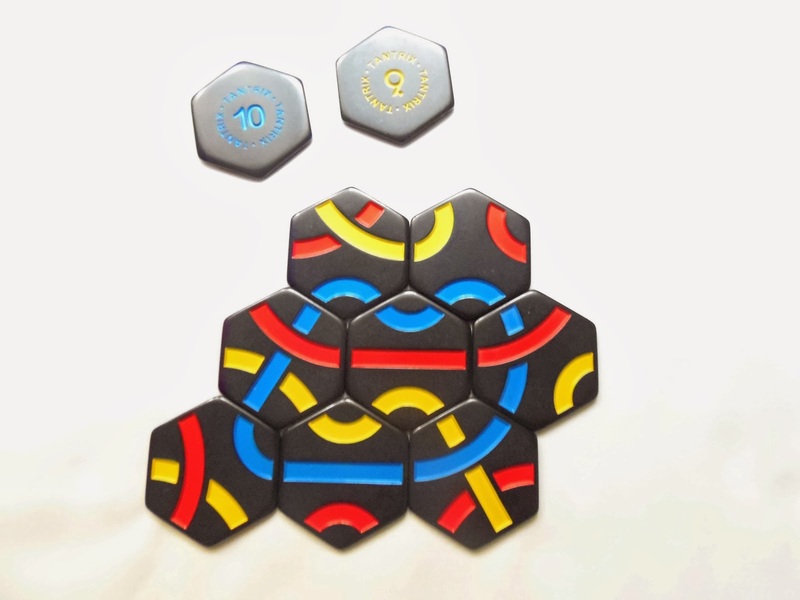 There have been many different versions of the Tantrix, but I'm going to discuss only on the Discovery one, and since I'm more into puzzles than games, I will only focus on the puzzle aspect of it, even though Tantrix is better known as a strategy game. 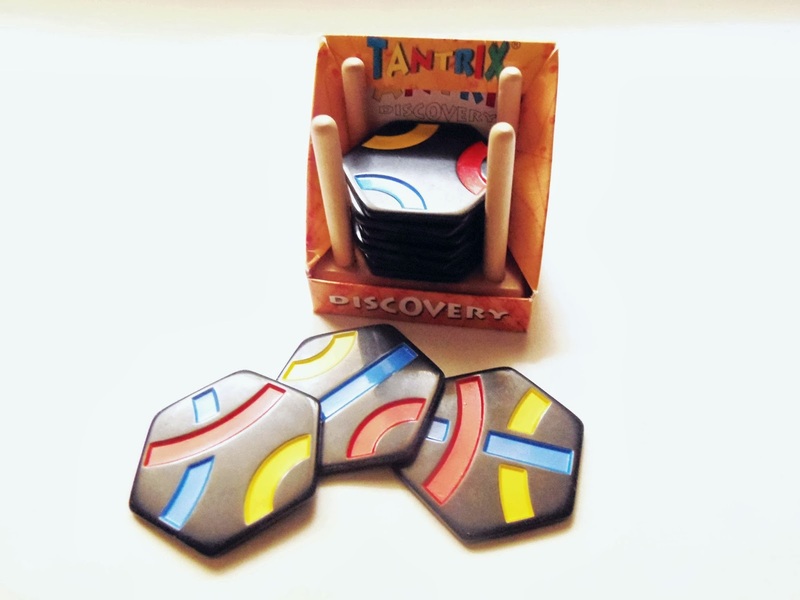 For someone unfamiliar with the concept, the Tantrix Discovery is the perfect set to start. 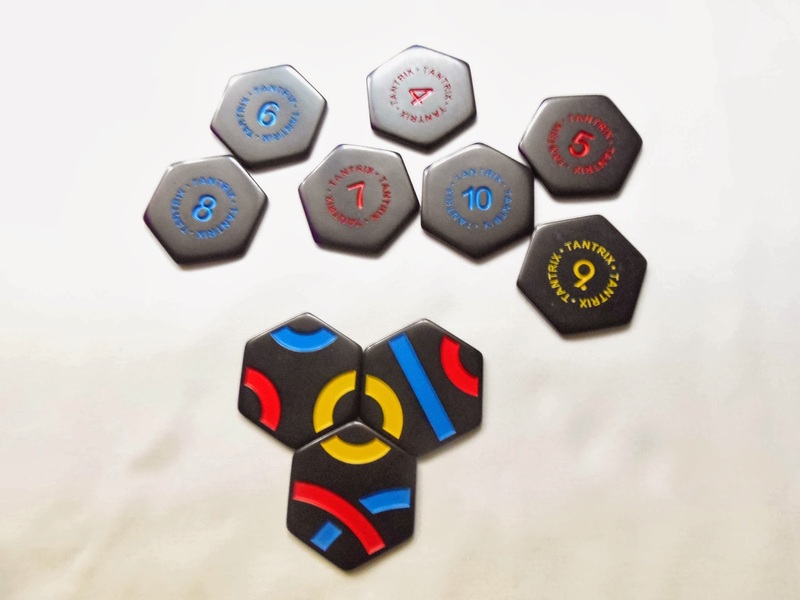 It comes with 10 distinct hexagonal tiles made from Bakelite (or polyoxybenzylmethylenglycolanhydride, for short), numbered and each with three lines of different colors. The lines can be curved or straight and, when connected, the tiles form all kinds of patterns. In this case, closed loops as required for the solo puzzles. First, place the tiles with the numbers facing up. Notice that the numbers have different colors. 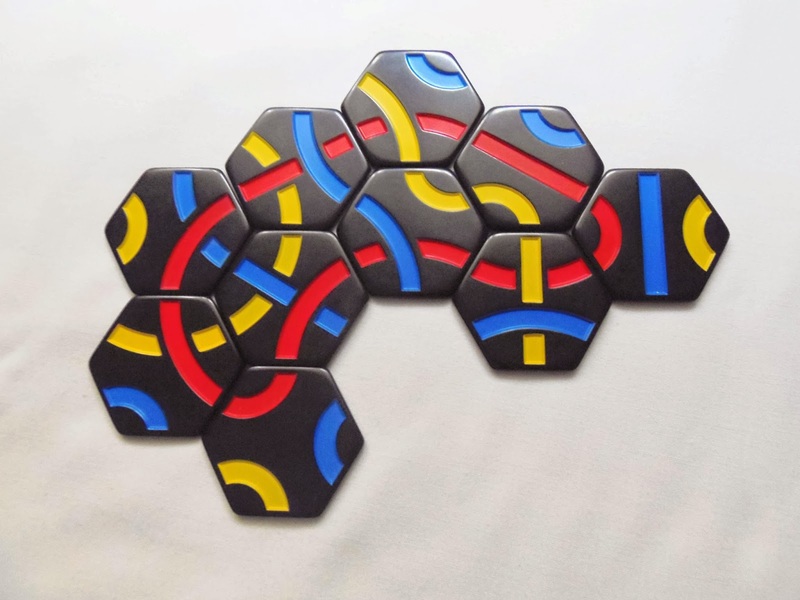 Pick the first three tiles and build a loop. Since the no.3 tile is yellow, the loop will also be yellow. Next, pick the tile no.4 and build a loop with the extra tile. Pay attention to the color of the number. You should continue with the same rules until you reach the final 10th tile. Here, you can build a loop with any of three colors, although red is easier and yellow is the hardest. When building a loop, all adjacent colored lines must match. Not just the ones in the intended loop. No holes are allowed in the construction of the loop. With this set of rules you're now ready to tackle the Discovery puzzles. The difficulty is obviously going to increase as you progress to bigger loops, but from what I've experienced they're easier than the expected times printed on the package, even though I was trying them for the first time. The last loop for the 10 tiles, the red one is expected to be solved in 18 minutes, but I was able to solve it within 10 minutes. All the others were solved within 5 minutes. I'm sure the 56 tile set is much harder, however, I found this simplified set too easy. (Click to Enlarge) - Loops made with 3, 5 and 10 tiles, respectively. The Tantrix Discovery is a great way to get to know this amazing concept. Most of you won't be able to stop with just this set and will want to venture to harder paths. Still, the Discovery set is a lot of fun to play with and I highly recommend it. Availability: You can get your copy of the Tantrix Discovery at Sloyd for just €12.10. 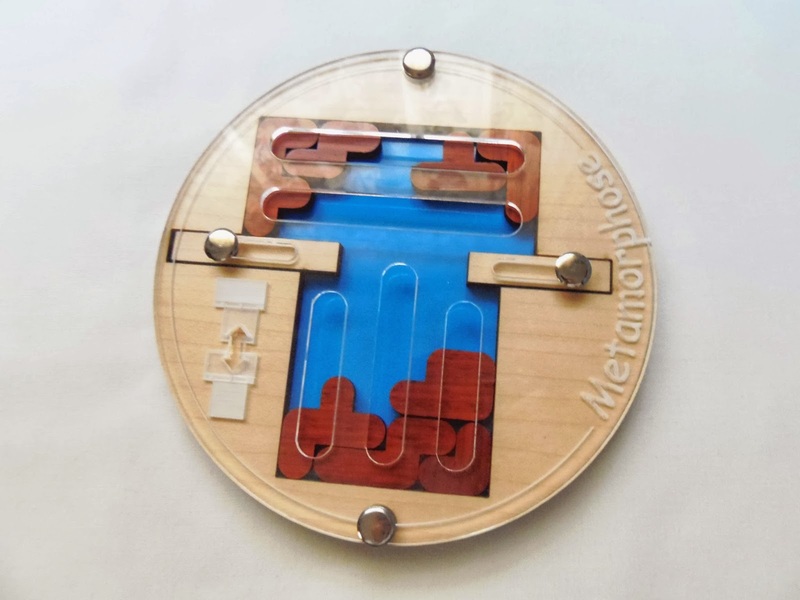 Metamorphose is an odd looking puzzle and yet quite interesting in the way that it's solved. 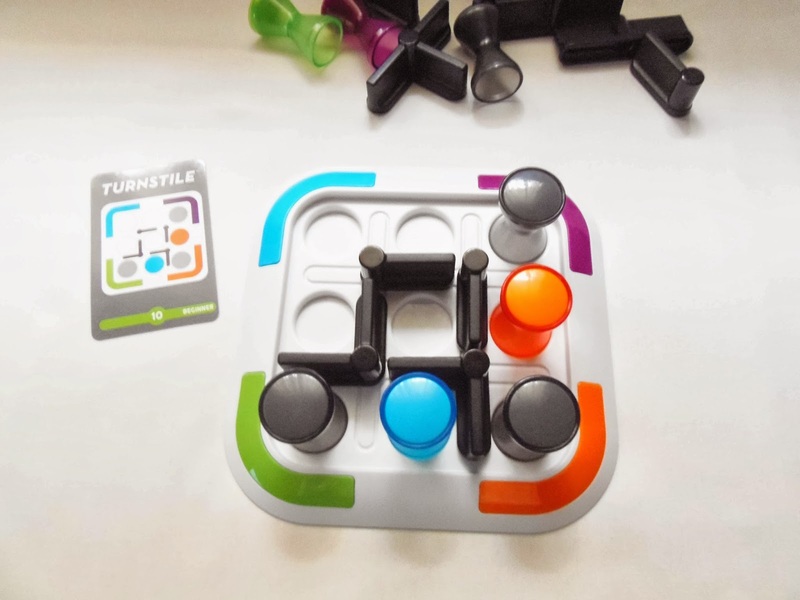 Jean Claude Constantin does a fantastic job on what could simply be described as a Tetris version for puzzle enthusiasts. The looks of the puzzle are self-explanatory. It comes in a solved state in the rectangular-shaped frame and by sliding the pieces down - hence my comparison with Tetris - you should try and rearrange the pieces in the square-shaped frame. The solution itself is not overly difficult, but the execution, which requires a little bit of dexterity, is quite tricky. 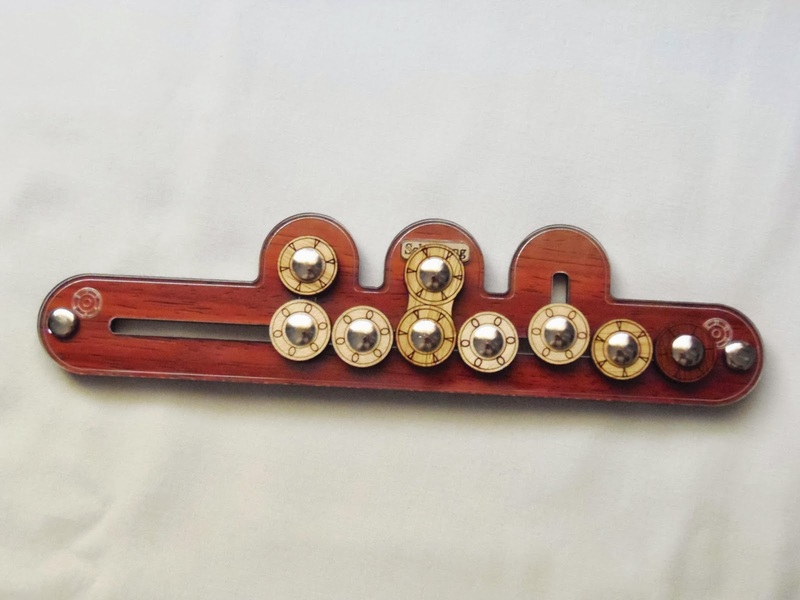 Between the two frames are two sliders that can open or close the flow of the pieces, thus limiting which pieces fall to the bottom at any given time. This is the part where the puzzle becomes trickier than your average packing puzzle, because you can't simply pick the pieces and place them where you want. The acrylic cover has holes above the frames that help you maneuver the pieces in place, but you can only do so much with so little space. Provided with the puzzle is a loose metal bar that, at first, I didn't know what I was supposed to do with it. When you first try to get the pieces in place on the opposite frame, I believe you'll know why it's there. It's a big help in keeping the pieces well orientated between the holes in the acrylic, since your fingers are too large to get in there. Other than this I don't see any other use for the bar, but I could be wrong. As I mentioned above, the solution itself is not that hard. You have eight different pieces. 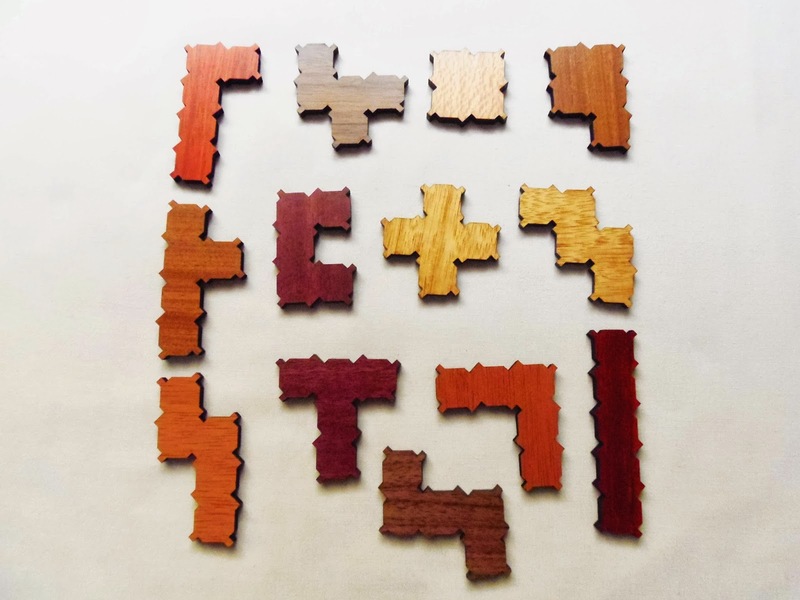 Some of which are actually seldom seen in packing puzzles, like the F-shaped piece and the three-square piece. The rest are composed by a mixture of tetrominos and pentominoes. For better or worse, you can't flip the pieces, so the only way you can change their orientation is by rotating them. This is will certainly yield much less possible solutions and, in mathematical terms, I'm not sure if less solutions could be considered a good thing or a bad thing, but given the 7/10 difficulty rating, which is not that challenging, I'm going out on a limb and say it's a pretty good thing. It took me about 20 minutes to solve it. Metamorphose is quite different from the packing puzzles you're used to. The limitations on the solving process provide a fun and different way of thinking and since you have two different frames and quite possibly many different solutions - despite the inability of flipping the pieces - there's plenty to do even after you solve it for the first time. Availability: The Metamorphose puzzle is available at PuzzleMaster for $25 CAD. You can also browse other interesting designs by Constantin. Granville is one of the most interesting rope puzzles I've tried so far, and definitely the best one in the Flabber Floovers collection. 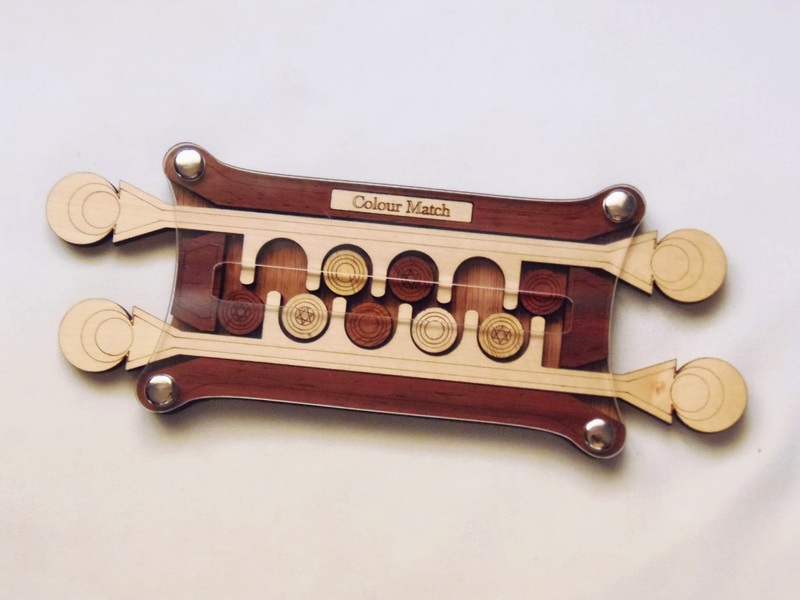 It has a very unusual goal, unlike any other puzzle I know. Curiously, this isn't considered a very difficult puzzle, and yet it had me stomped for a while. Read on to know more about this fascinating little puzzle. The puzzle looks very well built with different colors and materials. It actually has a very good quality/cost ratio, considering its low price. 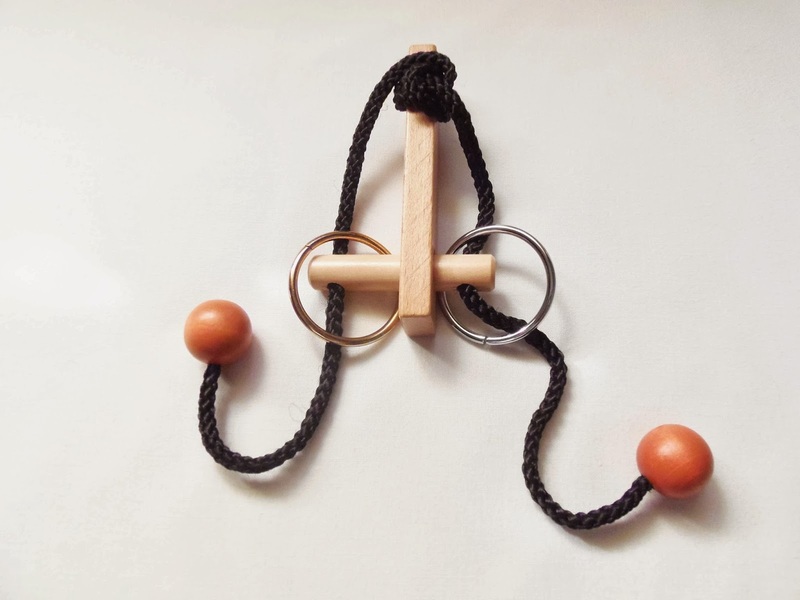 Comprised of two identical metal rings, except for their color - one is golden and the other silver - plus a rope with two beads attached at both ends, the goal is not like you'd expect in this kind of puzzles. Usually, your first impression about these puzzles is to remove one or more parts from the main body, and while you'd be correct 95% of the times, it's not the case with Granville. Here, the goal is just to exchange positions between the two rings. Sounds simple enough, but like I said above, I found it much more complex than I could ever expected. Now that I have finally solved it, I can't understand why it took me so long to figure it out. I guess the unusual goal of the puzzle was part responsible for the different approach needed. You often have the same mindset when solving a puzzle type you already know, and the fact that I didn't have to remove anything from the puzzle took more time to adjust. It was clear that the knot at the top of the puzzle was the key to solving it, but I dread all kinds of knots and so I proceeded carefully. 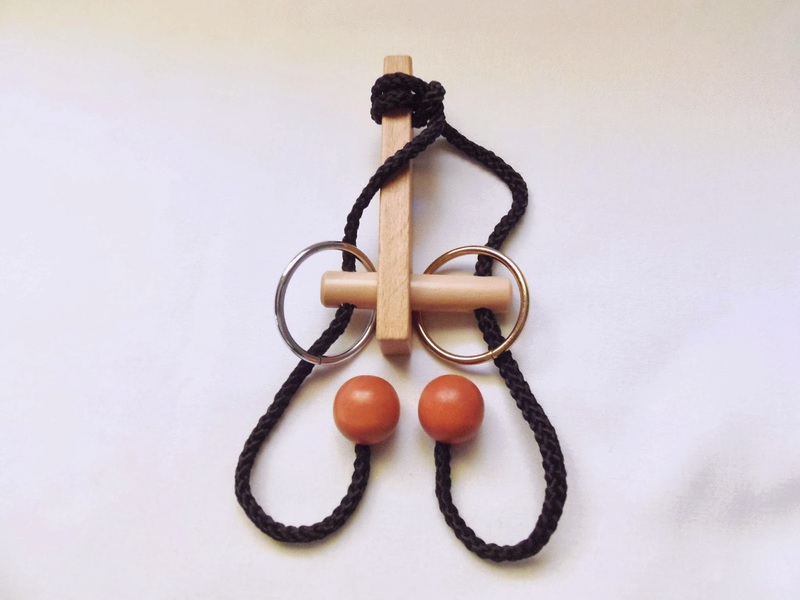 Since all you need to do is exchanging positions between the rings, the solving process is basically to follow the rope with one ring at a time until they are in opposite positions. You will need to constantly readjust the knot back and forth to allow each ring to travel from one end to the other, but once you find the correct steps, it shouldn't be too difficult. I was the one who was making it difficult for no reason. Just goes to show you you need an open mind when solving puzzles that require a totally new approach. Granville is quite unique when it comes to rope puzzles. Now that I understand its solution I can admire its beauty. It's a great challenge, even though it's classified as a level 2/4, and it's now one of my favorite rope puzzles. I highly recommend it if you're looking for something new and different. Availability: You can get a copy of the Granville puzzle from PuzzlesdeIngenio.com, in Spain. Worldwide shipping available. Update: Shortly after publishing the review for Granville, I received a message by a puzzle friend from Sofia, Bulgaria. Dimiter is a mechanical puzzle enthusiast and designs and produces puzzles as well. After seeing how original the idea of the Granville puzzle was, he was able to design and build three different models based on the same principle. The fact that he did all this in such a short amount of time is amazing. Below, you can see photos of those models. Photos 1 and 2, the objective is to exchange the two rings. 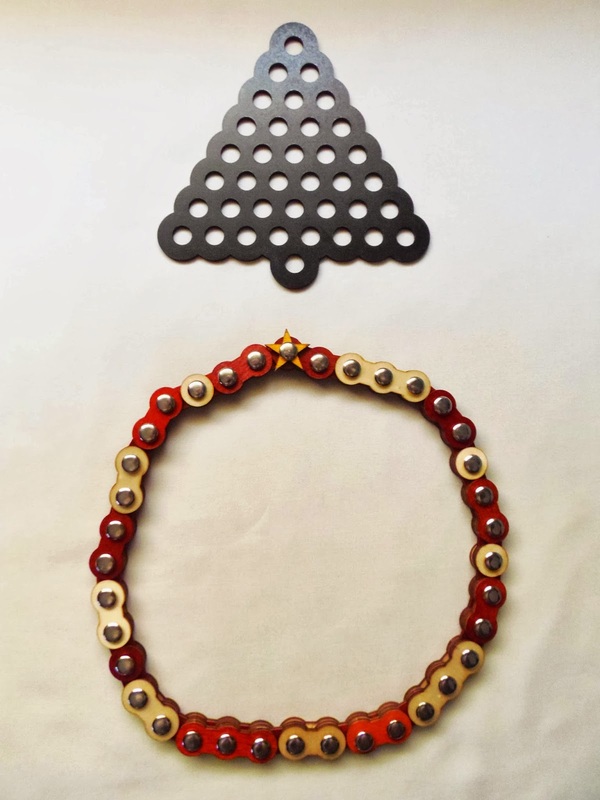 In photo 3, you need to place the black bead in the middle. One of the things I like most about mechanical puzzles is the ability of making different patterns. I have many puzzles like these in my collection and they're among my favorites. What's great is that once you solve one of its challenges there's always something different to attempt. You're not constrained to just one solution. You can also use your creativity, your imagination. 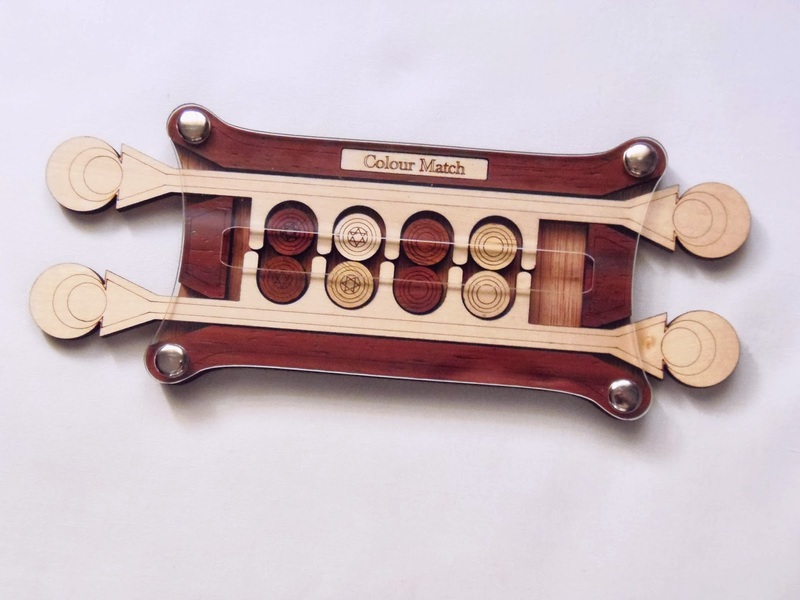 Colour Match, designed by Jürgen Reiche and produced by Siebenstein-Spiele, is one of such puzzles described above. You don't get to freely move the pieces or pick them up, due to the sliding mechanism, but you can still create several different patterns. The descriptions I've seen around about it are a bit contradictory, so I'm not sure what the main goal is. But to be honest, does it really matter? I was able to make a few patterns and each one is equally challenging, so all you really need to do is to choose a pattern you like and try to recreate it with the disks. The puzzle consists of two handles that slide across the horizontal plane. 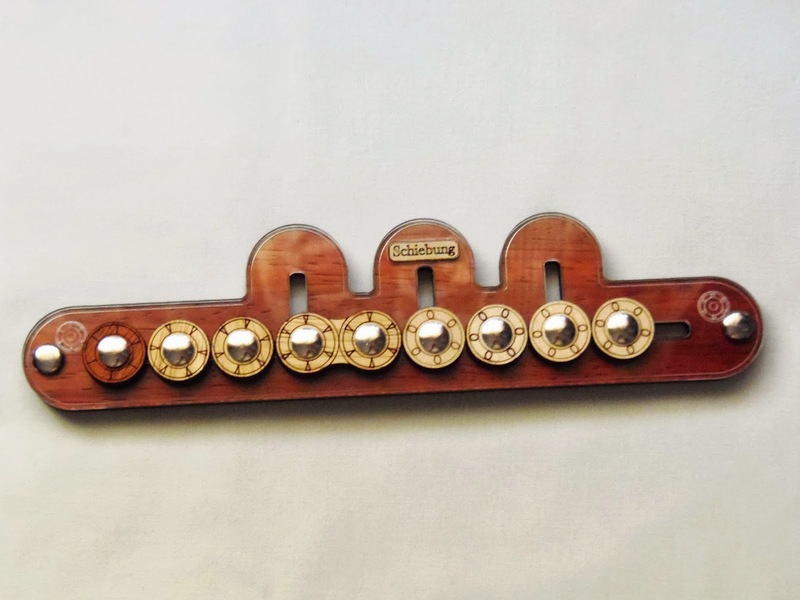 Each handle carries four disks but it can hold a fifth one on either side at a time. Alternating between the two handles and shifting their positions you'll be able to create empty spaces along their length. At any given time you'll have two empty spaces at your disposal. Being able to create the correct sequence of movements will prove harder than it seems and it will require some time getting used to. The patterns you choose can be anything from color or symbol. The disks are marked with either a star or a circle and there are four different colors, although the tones are harder to distinguish and more subtle between the dark and light colors. There are dozens of possible combinations of colors and symbols. For example, you can try to put all star symbols on the top row and the circles on the bottom; or you can try to put all darker colors on the bottom and the lighter colors on the top. If you want an easier challenge you can solve only by color without worrying too much about the order of the symbols, or do it the other way around and solve it only by symbols. As you can see, there are so many possibilities that you will be busy for a while. Colour Match is such a fantastic puzzle. 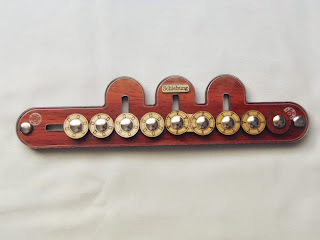 The ability to solve it into many different patterns surely extends its longevity and gives a good bang for your buck. It's quite challenging, so it's definitely not for beginners. Nevertheless, if you appreciate puzzles with multiple solutions this is easily a good choice for you. Availability: Colour Match is available at Sloyd for €17.80. It's never too late to show some Christmas spirit... Or is it? 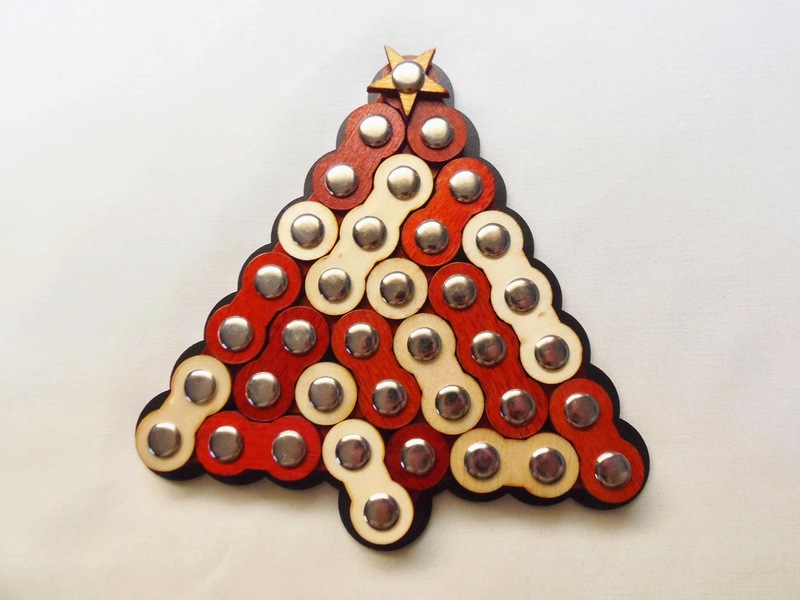 Tannen Girlande is Constantin's idea of Christmas ornaments and looking at the design it couldn't be more perfect for the puzzler in you. 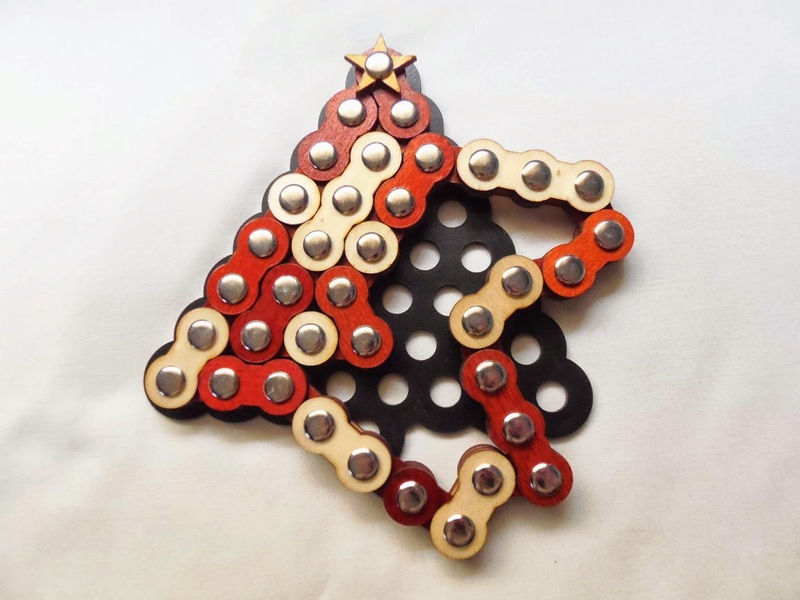 Made in the shape of a Christmas tree you'll soon find this will the the hardest one you've ever decorated. Tannen Girlande is comprised of a continuous loop made of 19 hinged pieces, reminiscent of a bicycle chain. There's no beginning or end, but the star at the top is a good way to help you in reassembling the chain back to its triangle shape. Don't go thinking this is a piece of cake to solve because of this small hint. In fact, the puzzle is rated as a level 9/10, and even though I reckon it's a tad easier than that, I still think it can be quite challenging. From the puzzle's 19 pieces, most of them are double-unit pieces, but there's also three triple-unit pieces and four single-unit pieces. To help you better distinguish them Constantin uses two wood colors, serving not only for practical reasons but for aesthetic purposes as well, creating a beautiful visual effect. 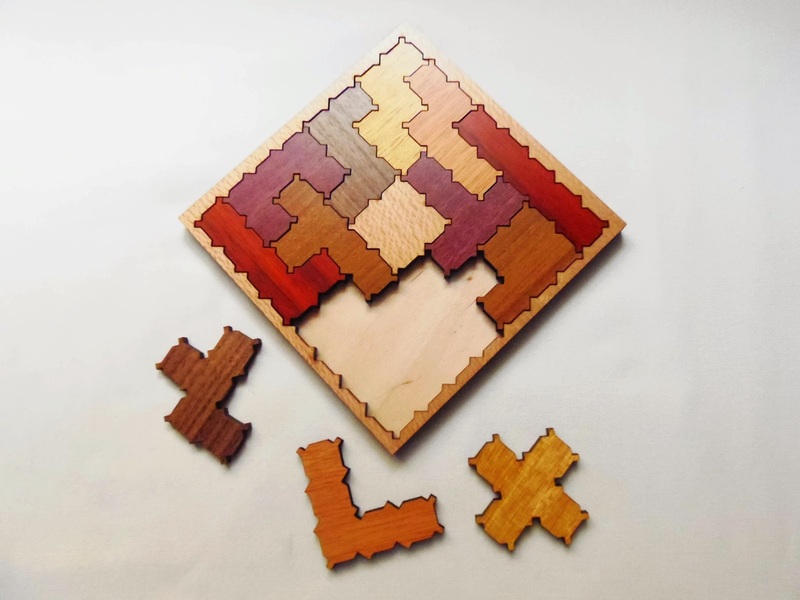 The pieces are connected and made using three layers of laser-cut wood, and while the quality is not as good as hardwood it helps to maintain the overall weight of the puzzle to a minimum and easily manageable. After gathering some courage and remove the entire chain from the triangle-shaped frame, I was now before a scary situation. The loop could be manipulated into countless shapes, and yet the only one required for me to solve this damn thing was taking its sweet time. Placing the first couple of pieces was easy, but as some pieces could be rotated beyond 180º and with all those empty slots screaming to be filled I knew this would take more than the simple trial and error approach you usually do with most packing puzzles. So, instead of starting in one end - since there's no beginning or end in the chain, I'm referring to the star - and work my way to fill all the slots hoping for the best, I took both sides of the chain - left and right of the star - and started to place them in the frame. This actually requires a bit of strategy and planning ahead, since you need to worry about the sizes of the segments and which ones to fold at the right angles. Nevertheless, and even with all these steps, the total time to solve the puzzle must have been about a couple of hours, as I didn't finish it in one sitting. Tannen Girlande reminds me of the times when I was little and had those fights with my bicycle chain trying to replace it. I'm sure some of you can relate. Solving the puzzle, however, can be ten times harder and more frustrating, but on the bright side you end up with your hands oil-free afterwards. 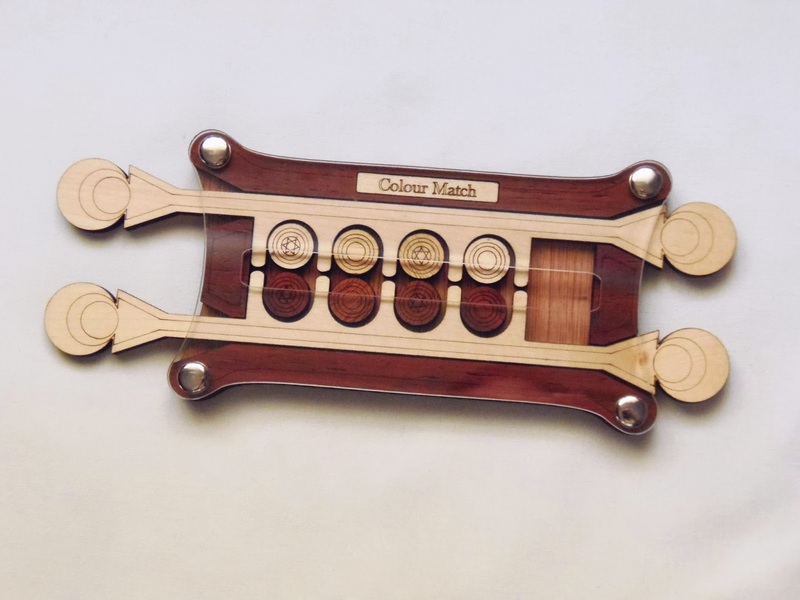 Availability: Tannen Girlande is available at PuzzleMaster for $49 CAD. To get to know other fascinating designs by Constantin be sure to browse his PuzzleMaster dedicated page. 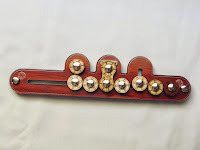 Puzzle locks can be grouped in different categories, whether they're Trick Locks, sequential movement (n-ary), or simply having a unique mechanism that requires several moves, but not particularly n-ary. The Sliding Lock by Jean Claude Constantin falls into the last category of unique designs, with a mixture of sliding piece and (partially) hidden mechanism. 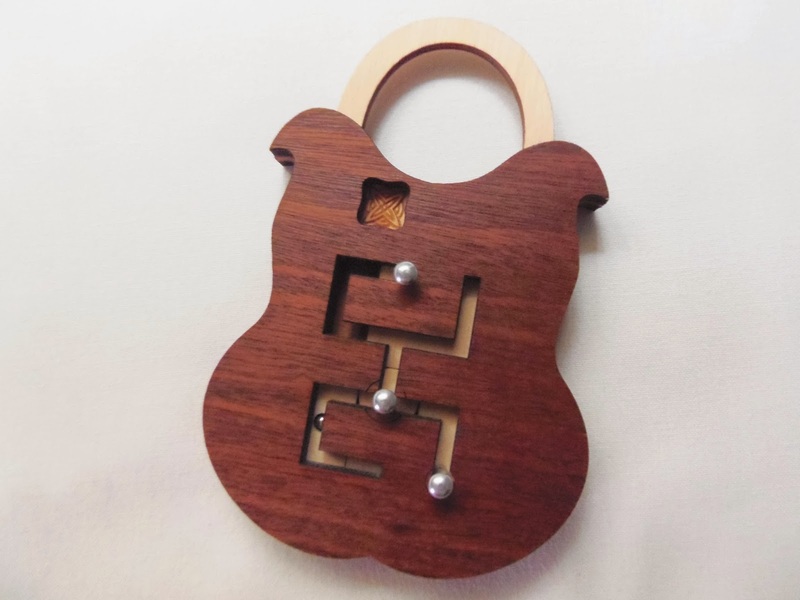 Constantin has designed quite a few different puzzle locks over the past years. 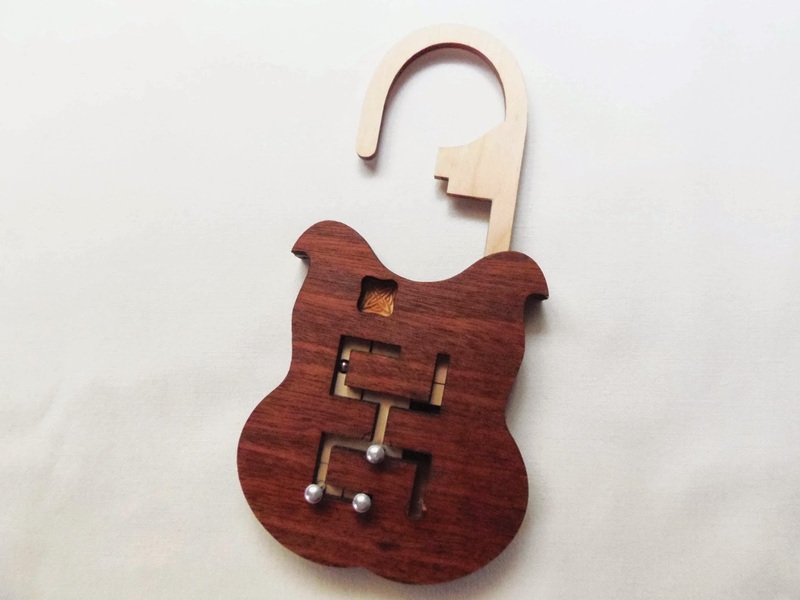 Some of his best puzzle lock designs are actually in the n-ary category, like the Maze Lock or the Lock 250, usually requiring hundreds of moves to be opened. The sliding Lock, fortunately for the less courageous puzzlers, only needs about a dozen moves, but it doesn't mean it it'll be easy. I can guarantee it'll be less frustrating, though. The puzzle has a nice feel to it. It's not too big nor too small, measuring 12.5cm x 8.3cm (4.9" x 3.3"), and I like its overall shape, reminiscent of an electric guitar's body. 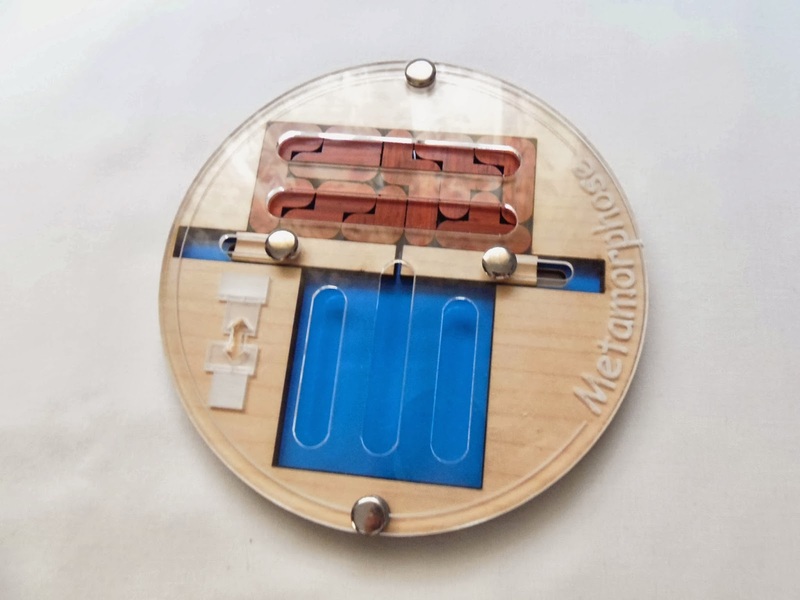 It's made of laser-cut wood, thus feeling very light in your hands, and the mechanism is comprised of three metal pegs that have the ability of sliding across the maze-like path. There's a fourth sliding piece, without a metal peg, having instead a small ball-bearing in the middle. The idea is to create a path with these four pieces so that you can lift the shackle. 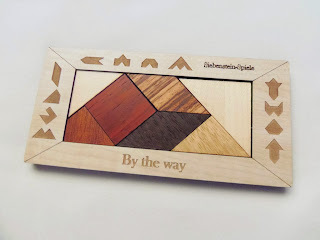 There are markings on the wood indicating where at least two of the pieces should be in its starting position. When you get to open the lock, you must try to close it again and return the pieces to their original configuration. The puzzle didn't take me long to solve. I reckon it took less than 10 minutes, and most of that time was trying to figure out how to create a space for the bottom right peg to be moved and release the shackle. Once I discovered the correct move it was even easier to put the pieces back. In the end, I didn't find the Sliding Lock very challenging, but I really liked its mechanism and enjoyed the solving process. 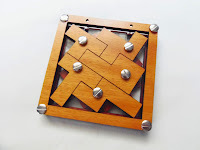 The design could easily be adapted to a more challenging puzzle. Here's hoping for a Sliding Lock 2.0. 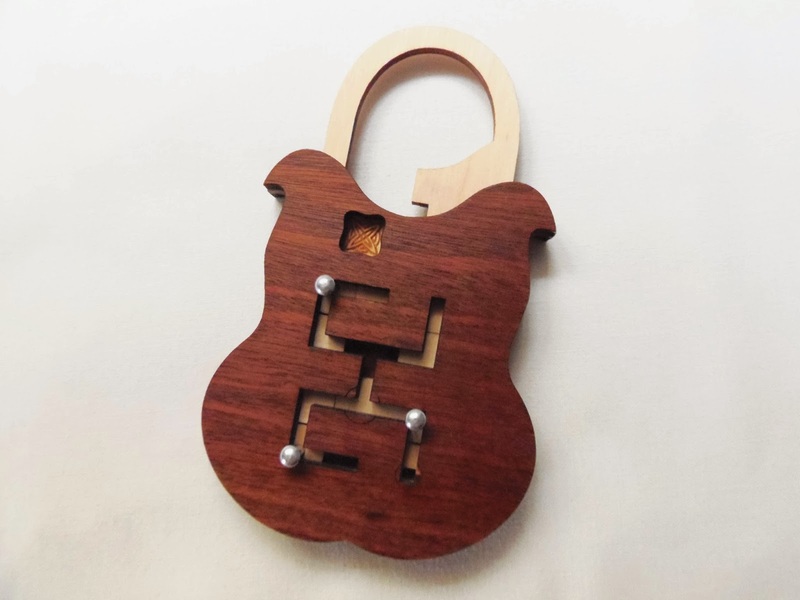 If you like puzzle locks this is definitely a must-have. Availability: You can find Constantin's Sliding Lock at Sloyd for just €14.90. Doppelschicht, can you pronounce it? Don't worry, me neither. That's how Jean Claude Constantin names his puzzles, and I reckon it's kind of cool. The German language certainly has many interesting words, and this particular one is literally translated as "Double Layer", which is a perfect description for the puzzle you see here. If you're used to solving 2D pentomino-type puzzles you'll feel right at home with the Doppelschicht... Well, almost. 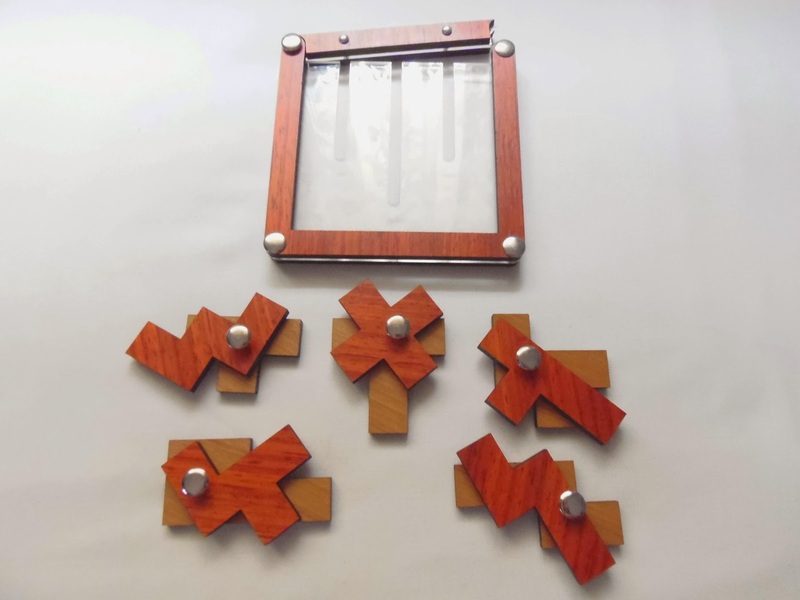 The puzzle consists of five distinct pieces, but in reality each piece is attached to another one by a metal peg and they can be rotated in 360º when out of the frame. Most of the pieces are pentominoes, except for two, a tetromino and a hexomino. 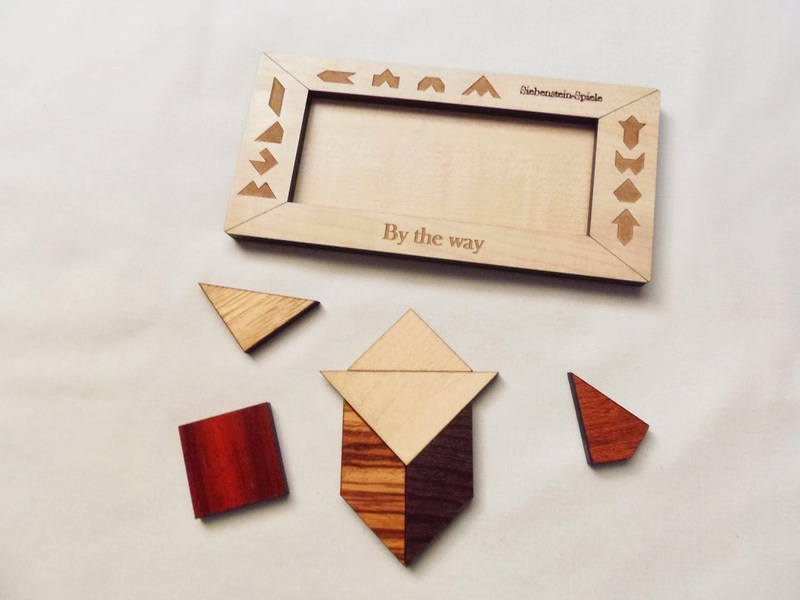 This interesting two-layer mechanism makes the puzzle a 2-in-1, as you try to work out how to place each piece on both sides at the same time. 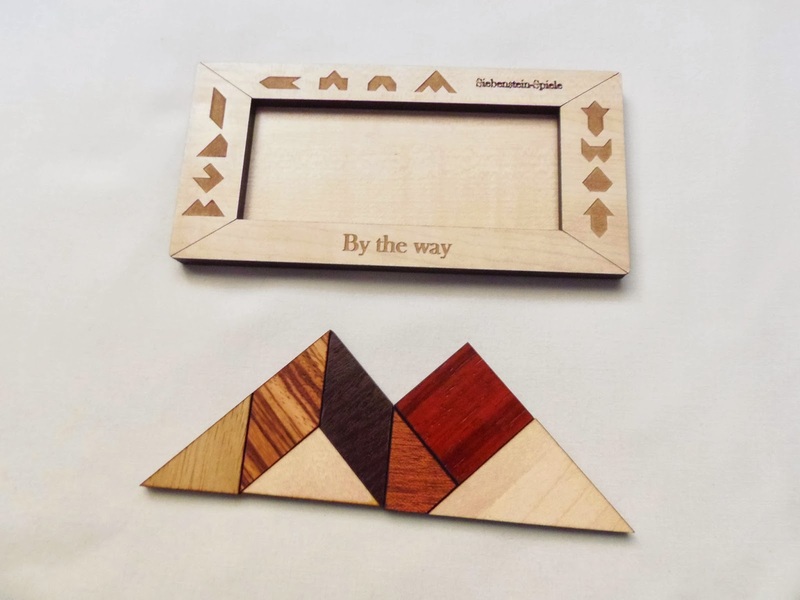 To better distinguish between the two puzzles each layer has a different wood color, so all you just need to do is to find a way to slide all the pieces into the frame. The size of the puzzle is quite decent, measuring 11.2cm in diameter (about 4.4"). The pieces slide through three channels that go about half way through the acrylic window. The middle channel actually goes a bit further down, and pretty soon after you try and solve it you'll find out why. To get started all you need to do is take out all the pieces from the frame. They slide out through the top which opens and closes sort of like a clapperboard. Getting the pieces inside the frame again is a challenge though, and requires a bit of dexterity. Placing the pieces one by one on the frame is not a good idea since you need to make adjustments as you go. My advice is to try and solve the puzzle outside the frame and then slipping the pieces in when you're about done. The hard part is to visualize the solved puzzle, because the edges are not flat but instead in a seesaw pattern. The Doppelschicht is rated as a 7/10 difficulty level, but I'm not sure if I totally agree, because of the reasons pointed above. I had to constantly check each piece to see if they fit well in the frame, but after a couple of successful tries it got a bit easier. Good thing the puzzle has only five pieces, otherwise it would've been much harder. I quite liked the Doppelschicht puzzle. It's a very original design with a new and interesting mechanism, visually stunning, but that's not a new thing for Constantin. He has already accustomed us with so many fascinating puzzles I seldom feel disappointed. Is it a must-have for a Constantin fan? Absolutely! 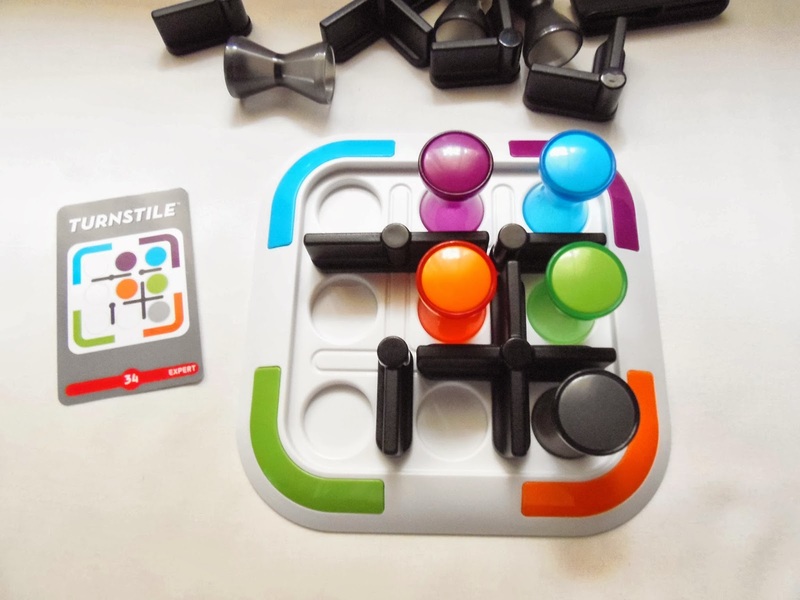 Availability: Doppelschicht is available at PuzzleMaster for $28 CAD. You can also browse many more interesting designs from Constantin. 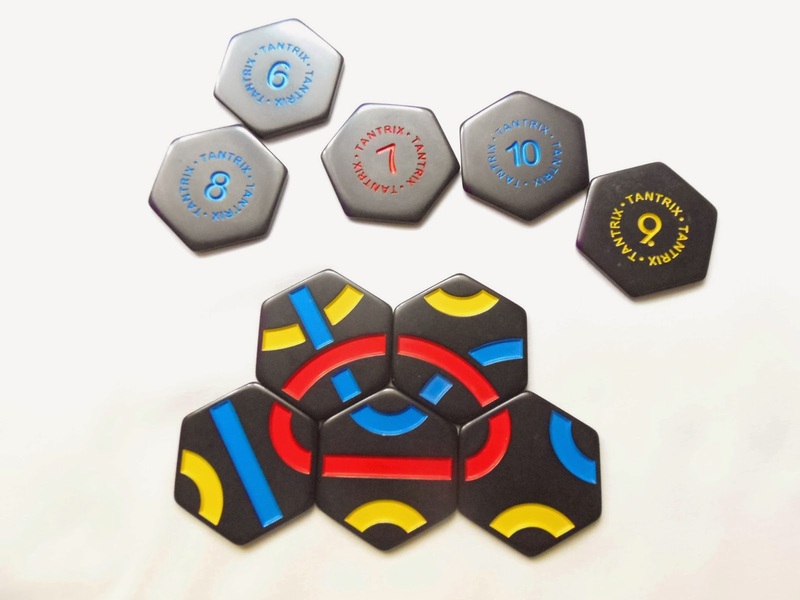 Turnstile is a rather unusual logic game from ThinkFun. The presentation is very elegant and colorful, but can be a bit confusing to understand. As you go through the included 40 challenges, the difficulty level increases and some of them can be quite tricky to solve, putting your wits to the test. 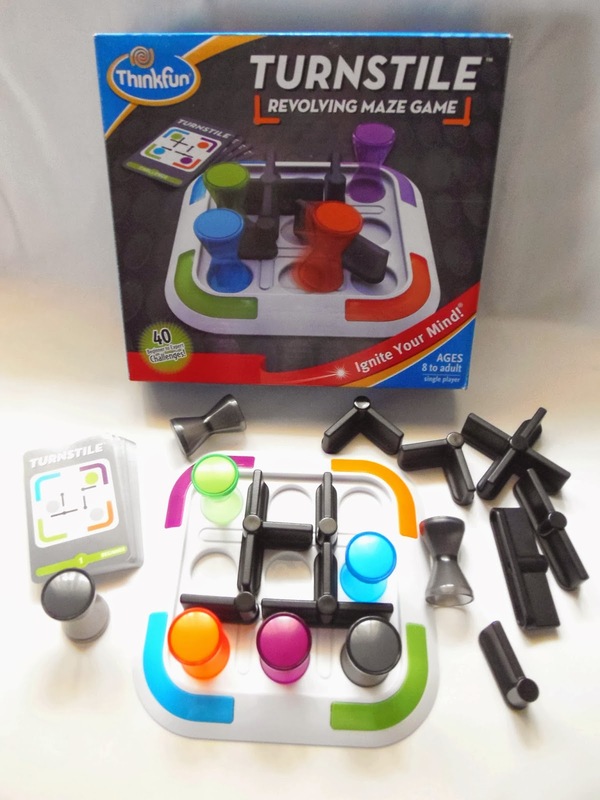 The game was invented by Steve Hayton and ThinkFun started production in 2011. Like many of ThinkFun's logic games, there's something about this one that makes it quite addicting. The idea of going through all challenges seems like an arduous task, but as soon as you understand the concept, you'll solve them in no time. Turnstile can be described as a dynamic maze. In other words, as you try and solve one of the challenges you'll make changes to the overall appearance of that particular maze. You need to be thinking two or three steps ahead, as a misstep in the wrong direction could mean starting all over. 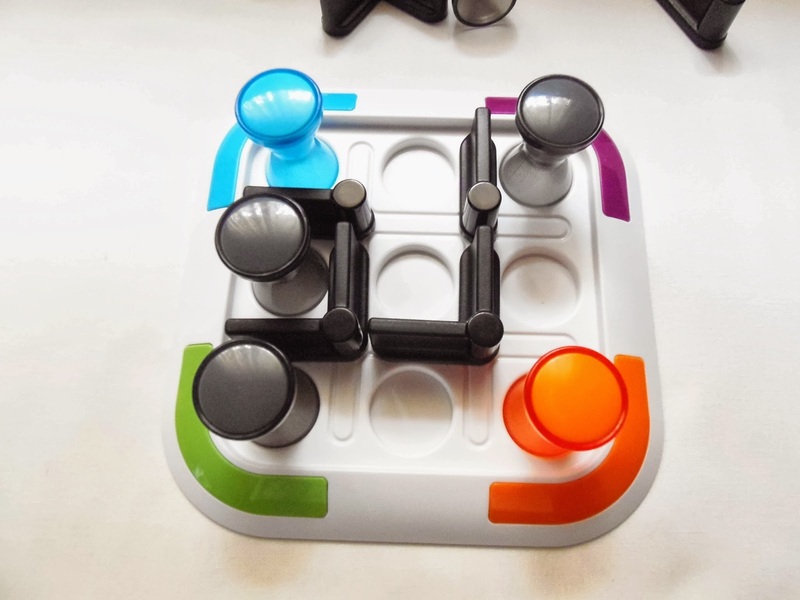 The main goal is to get all four colored tokens to their respective corners, although some challenges, particularly in the easier levels, only require the use of one or two colored tokens. Blocking your way are turnstiles that constantly create new paths as you pass through them. To make your task a little more interesting you also have to worry about the gray tokens that can actually be used in your favor, to open new paths. You start by picking a challenge from the deck. If you're unfamiliar with the puzzle you can start by the easier ones and go through the four different difficulty levels. After setting the game grid you can now move the tokens through the maze and get them to their correct spaces. There are a few rules you need to be aware of. You can only push the turnstiles, one quarter of a turn, with a token. You move the tokens one at a time, in any direction except on the diagonal, and always to an adjacent space. If there's a token or other turnstile blocking your way it means the correct path must be through somewhere else. Just keep practicing and you'll eventually find the correct way to solve it. Difficulty-wise, Turnstile can be pretty challenging, especially the last ones due to the large number of required moves, which also increases your chances of doing something wrong. This is not the easiest game to understand at first, and you may need some time getting used to it. Turnstile turned out to be a great surprise. I wasn't expecting much out of it, but found it to be quite fun and entertaining, and most importantly, addicting. If you like this sort of logic games I'm sure you'll love Turnstile. Availability: Turnstile is available at Sloyd for €25.20. Pentac Zigzag is Constantin's twist on a classic packing puzzle, using all 12 known pentominoes plus the square piece. An otherwise rather easy to solve puzzle is herein turned into a fiendish challenge by redesigning each piece with a unique saw pattern. Forget what you know about pentominoes, for the Pentac Zigzag will need a completely different approach to be solved. The presentation of the puzzle, like any other by Constantin, is superbly well made. The pieces are laser-cut in seven different wood colors giving the overall appearance this mesmerizing visual effect. With a diameter of 13.6cm (5.4"), the puzzle makes for an incredible decorative item as well. 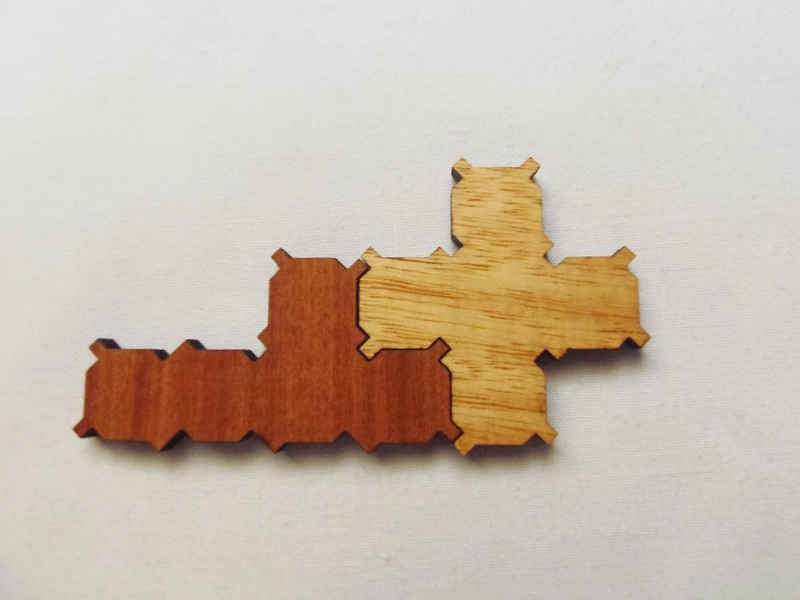 Given the nature of the laser-cut wood, the puzzle also feels very light. It's not the best of qualities for a wooden puzzle, but gets the job done. Like I said above, the pieces are cut with a unique saw pattern. Even knowing this is done with machines the level of detail is incredible and the thought that went into its design is mind-blowing. The pattern is so unique along the edges of each piece that when you take a closer look, especially when you're repacking the pieces, you'll notice that not all pieces fit like they should, or like you'd expect. When taking into account a flat-edged puzzle you just assume that all pieces will fit along the edges of each other without even thinking about it. With the Pentac Zigzag you must forget all your assumptions, because not all two-piece combinations won't fit together. In most cases, they simply won't. Below is an example of how a simple piece rotation can make the two pieces impossible to fit together. As a puzzle with an 8/10 difficulty level, I was expecting some trouble but not that much. Seems I underestimated it, because this was one tough nut to crack. Why is it so difficult, you ask? Mainly because even if you see that a piece can be placed in a particular orientation it might turn out to be impossible to place it there, due to the irregular grooves on its edges. This turns an otherwise ordinary and logic solving process into a trial and error task. It can get quite frustrating. 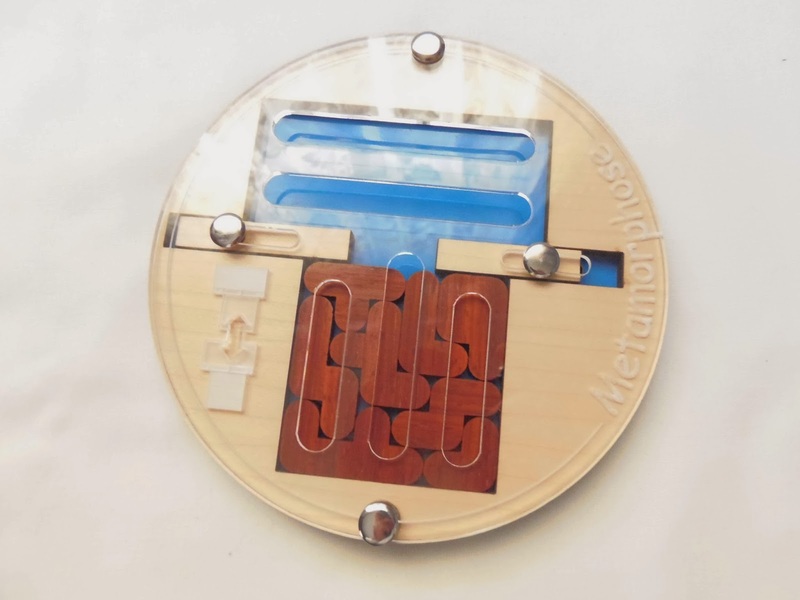 Again, due to irregular nature of the pieces, I can't say for sure it this has multiple solutions or if it was designed to have one single solution. The fact that I came to the same solution as the one in PuzzleMaster's photo it might be an indication of the puzzle's uniqueness. 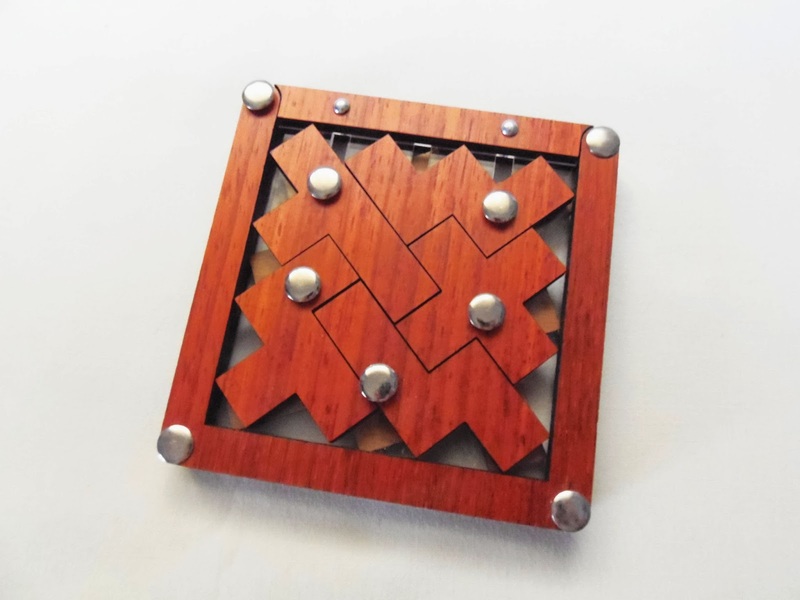 Pentac Zigzag is a great-looking puzzle and it will be a great addition to any collection. However, for a puzzle, it has too much randomness to my taste. You can't use much logic with it, so you're faced with the old trial and error approach. It's not extremely difficult, just too darn frustrating. 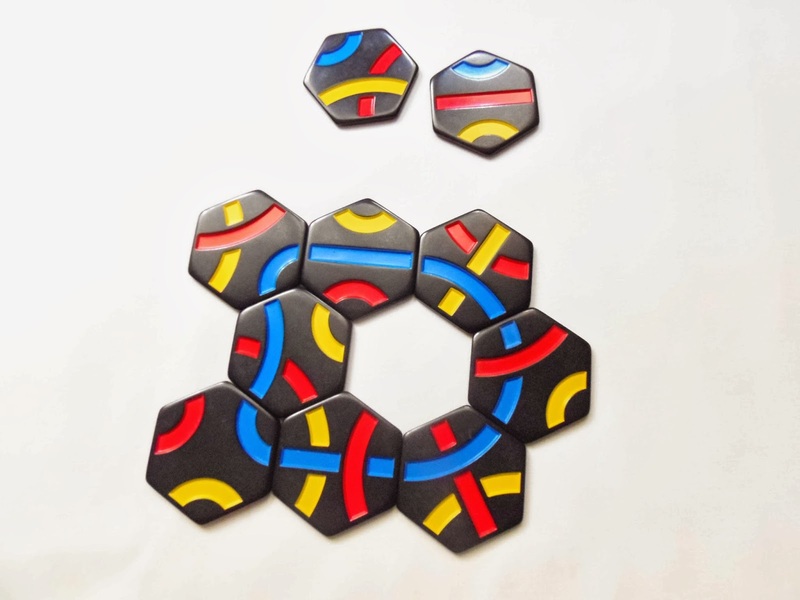 Availability: Pentac Zigzag is available at PuzzleMaster for $24 CAD. You can also browse other amazing puzzle by Jean Claude Constantin. Sliding piece puzzles have always been one of my favorite types of puzzles. They're easy to pick up, sometimes quite challenging, and there's such an incredible variety of different designs and concepts that you'd never feel bored. Schiebung (German for 'shift'), designed by Jürgen Reiche and produced by Siebenstein-Spiele, is an intriguing design, confusing at first, but visually stunning. 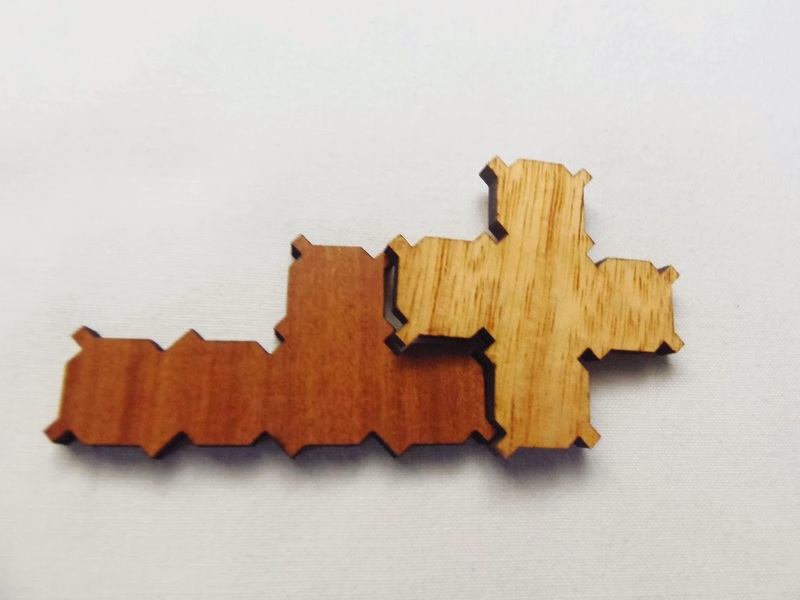 This odd puzzle is comprised by three groups of pieces: four light brown ones engraved with 0s; three medium brown ones engraved with Vs (one of them is actually two pieces joined together); and finally a single piece, dark brown, engraved with an I. The pieces slide along the length of the puzzle with three separate slots above the common space. The Schiebung comes already solved with a pattern, with the light colored group on the left, the medium colored one in the middle and the dark piece in the right. 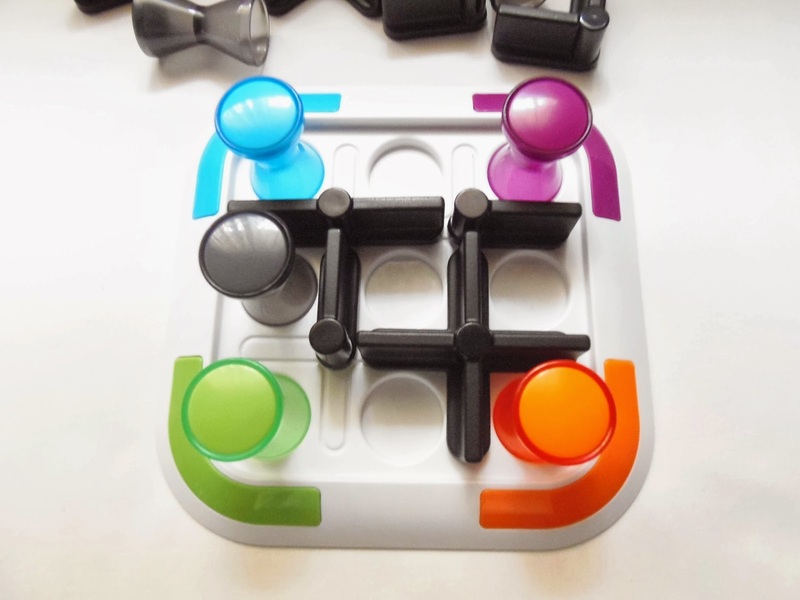 Your task is to shift the pieces' positions and put the dark piece on the left and the light colored ones on the right. The medium colored pieces stay unchanged in the same position. You could try an easier pattern, with just a few moves, which is to put the dark piece in the middle of the two groups. 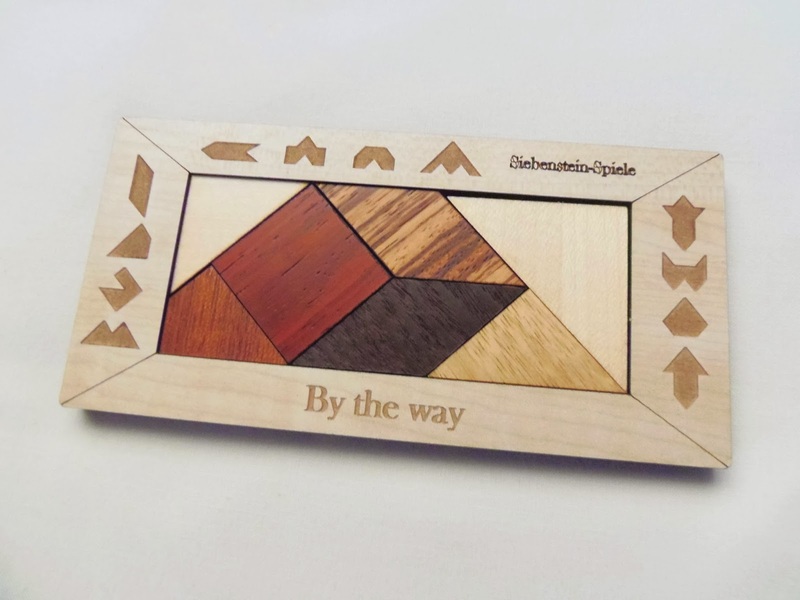 As for the design itself, Siebenstein delivers yet again a beautiful example of their perfect craftsmanship, an utmost attention to detail as seen by the decoration of the sliding pieces and the actual overall shape of the puzzle covered with acrylic for an extra shiny effect. The wooden frame is deep dark red, very elegant which also works well with the contrasting colors of the pieces. The movement of the pieces is rather smooth and loose. I haven't had any problems while I was playing with it. Difficulty-wise, it looks harder than it actually is. The manufacturer rates it as a level 3/7 and I completely agree with them. I found it to be fairly easy and was able to solve it within five minutes on my first attempt. I believe the inclusion of three slots made the puzzle quite easy to solve. Maybe with just two slots it could've been a little more challenging, although I'm not sure it would be solvable that way. I actually tried this by not using one of the slots, but couldn't solve it so, unless I was doing something wrong, it's possible it had to be done with a minimum of three slots. Unlike many other easy puzzles, I actually don't mind the easiness of the Schiebung. I really liked the concept and love to play with it just to keep changing the position of the pieces. It's an excellent puzzle to keep around just to unwind. Availability: I got my Schienbung copy from Brilliant Puzzles, but unfortunately it's currently out of stock. Check back again soon or browse from other available Siebenstein-Spiele puzzles. No, what you're seeing is not a Tangram set, although it closely resembles one. It has seven pieces, like a Tangram set, and you can also build countless shapes with the pieces, but it's not a Tangram set. The similarities don't stop here, though. Just like on a Tangram, the pieces are grouped in two pairs of identical pieces and three unique ones. Most of the pieces on the two puzzles share the same shapes as well, like a square, a rhombus, even a small and a big triangle are present. The BIG difference, and I mean to emphasize big, is the irregular quadrilateral shape that'll sure get you some headaches. Meet 'By the Way', a Tangram variation designed by Jürgen Reiche and produced by Siebenstein-Spiele. By the Way comes in a nice rectangular tray with several shapes engraved on it to get you started. If that's not enough for you, the included instructions have several more. In total there are over 20 shapes to solve, and although it doesn't seem much, believe me they're more than enough given the high difficulty on some of those shapes. 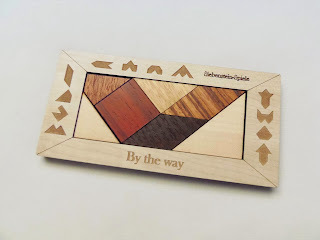 The presentation of the puzzle is complemented by a pallette of colorful pieces, as each one is nicely done in a different wood color. It's a relatively small puzzle, but still pretty good to handle, measuring 15.2cm x 7.4cm (about 6" x 3"). If you love to build shapes with a Tangram set, then 'By the Way' is the right puzzle for you. I should warn you though, this is a much harder puzzle than the Tangram. 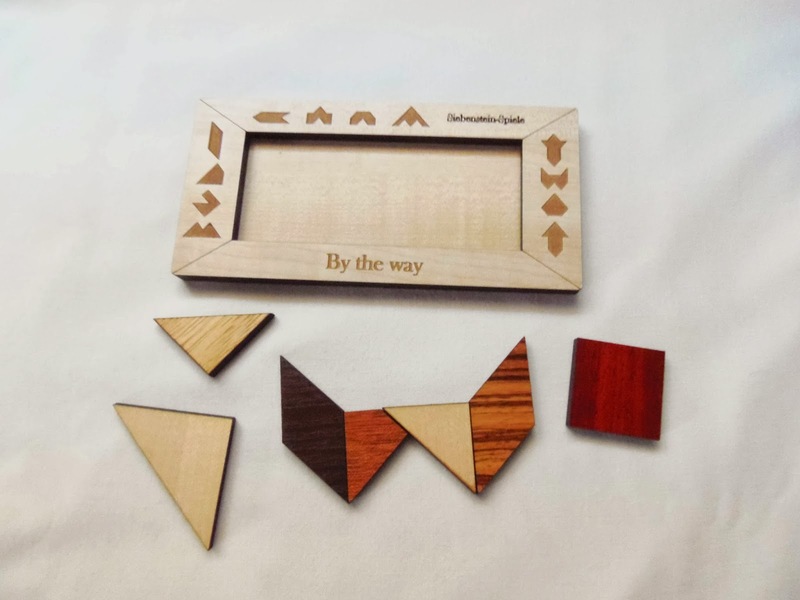 I also have a Tangram set and have solved many of its countless puzzles, and even though some are quite harder to solve, they can't be a match for the ones you'll face with Siebenstein's fiendish variation. I haven't solved all shapes included with the puzzle, mainly because it would take a lot of time and patience. I did solve a few of them, but I've encountered an issue that I'm not certain if it's supposed to be that way or I just wasn't very good at solving them. Some of the shapes appear to be solvable without using all the pieces. I've tried to solve these shapes using all seven pieces, but to no avail. Below are two of such examples. What do you think? My guess is that I should try harder, because if the Tangram is any indication you must use all pieces to solve any of the shapes. More over, if you take into account the relative scale of the example shapes the solutions don't appear 100% correct. The provided instructions aren't clear on this subject, so until proven wrong, I have to assume that some shapes can indeed be solved without the full set. Nevertheless, this is quite a challenging puzzle and I like its high replay value. 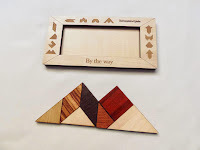 Also, just like the traditional Tangram puzzles, there are multiple solutions for each shape. 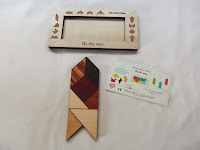 By the Way may be too similar with the Tangram to add any significant value as an original puzzle, but if you're a sucker for dissection puzzles and you like a challenge, then I highly recommend it. If you've solved all the included shapes, you still have plenty to do, as you can always create your own shapes. Availability: By the Way is available at Sloyd for just €13.